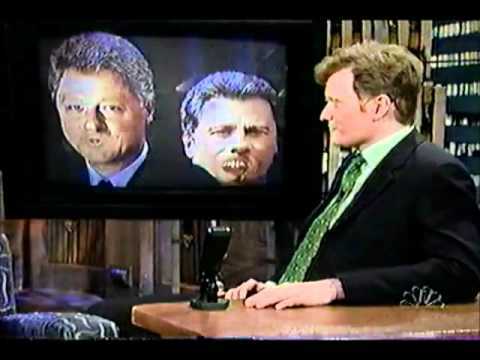 Some may be familiar with a frequent guest to Conan’s show in the 90s: “Bill Clinton” as a talking picture. Similar to The Onion’s Joe Biden character, this Bill Clinton is a wild fun-lovin’ southern boy out to have a bitchin’ good time. From the mastermind Robert Smigel, also known for Triumph the Insult Comic Dog and many other characters, this was just one of a few other celebrities that would visit the show in this format; including: George W. Bush, Arnold Schwarzenegger, Don King, Bob Dole, and a few more. Here are a few clips of these segments that some awesome Conan fans have uploaded to You Tube.